We were able to look the other way when a Garfield-themed eatery began slinging lasagna in a location as remote as Dubai. At the time, it seemed like there would be very little threat of the world’s most famous, obese cat moving his burgeoning food empire into our own territory. But now comes this disturbing news: The Garfield restaurant chain is moving to North America. Five years from now, there will probably be one in your own city. Be very afraid. The app-based ‘mobile restaurant’ is already operating in Dubai, where drivers deliver orders for free in environmentally-friendly packaging while riding on green electric Garfield scooters. What kinds of delicacies will be available via GarfieldEats? 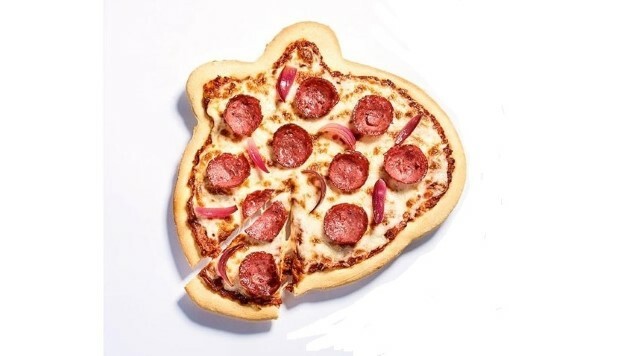 Well, coffee and fruit juices will be on the menu, including, and I quote: “Garfaccinos.” Also available are the signature pizzas, whose selling point is that they’re vaguely in the shape of Garfield’s lumpy skull, which you can see above. Personally, I love the way it distorts the shape of all your slices. Brilliant marketing scheme, or a convenient way to dispose of a trove of irregular, malformed frozen pizzas? You be the judge. You can find many more details about the pizzas in particular via the GarfieldEats website, which is truly breathtaking in its obnoxiousness. Not since the 1990s have we seen a website that features multiple auto-playing soundtracks at the same time, but somehow that seems perfectly fitting for the website of a Garfield restaurant. Even stranger than the menu, though, is the way the GarfieldEats physical location operates. Running on a cashier-less model, the restaurant instead features a wall of mobile phones that allow ordering through the app, in addition to offering augmented reality games that the company refers to as (gag) “enter-gagement.” It’s unclear whether you’re then allowed to eat your food on premise, or need to carry your rapidly cooling Garfield pizza back to your domicile where you can better feel the sense of shame you’ve clearly earned. What’s left to say? Some 40 years after his birth, Garfield remains an unstoppable force of pop-cultural blandness. If you’re not sold on the idea yet, allow a rheumy Jim Davis to sizzle it for you below.